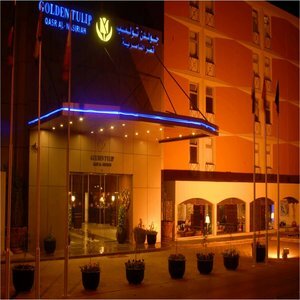 Golden Tulip Al Nasiriah is located on the Al Maather street(junction of Al Takkasusi st and Al Nasiriah Street) very near to Ministry of Interior or King Faisal Specialist Hospital, Hyper panda, Intercontinental Hotel, and Ministry of public security. For guaranteed reservation, rooms are reserved until 06:00 pm and if no show by that time one day will be charged and the room will be released from the system. Cancellation of greservation must be informed 24 hrs prior to the date of check- in. Golden Tulip Al Nasiraih, is located in the heart of the city, proximity to King Faisal Specialist Hospitals, Ministry of Higher Education, Ministry of Foreign Affairs, Ministry of Interior and other important Goven'ment offices, easy access to embassies, all banks, airlines offices, major shopping center and 40 kms distance from the King Khalid International Airport. From takkasusi street pass the king faisal sp. hospital reach the Maather street were the hotel is located. Take King Fahd Road ,take exit near Ministry of Interior and take left turn to AL Maather Street.